Beginning her TV career as a trainee PA working on The World Today for the BBC World Service, at age 19 she moved to Hong Kong where she presented the news on English language television station TVB Pearl. Upon returning to the UK three years later, she worked as a secretary in the BBC Children's department. In 1983, she landed her first major TV job as the jump-suited, constantly-in-motion skyrunner in Treasure Hunt which was hosted by former BBC newsman Kenneth Kendall. Cameraman Graham Berry was nominated for three BAFTA awards for his camerawork on Treasure Hunt, of which he won one in 1984. Both Berry and helicopter pilot Keith Thompson went on to become minor celebrities, whilst Rice left the show when she fell pregnant in 1988 (being replaced by former tennis player Annabel Croft). Treasure Hunt was also nominated for a BAFTA award in 1986 in the category "Best Light Entertainment Programme". In 1986, she was awarded the "Rear of the Year" award via The Sun newspaper; an unsurprising award, since her posterior had featured so much in the lens of Berry's camera. 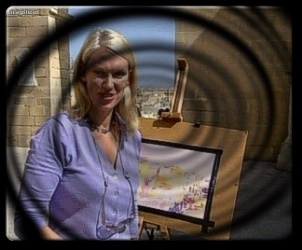 After hosting the BBC's Children in Need appeal, Rice launched her own programme Challenge Anneka in 1989, a series which was to run for another 5 years and was recently revived by ITV as part of their Christmas 2006 schedule.